Filler Powder Volumetric is a volumetric powder filler that uses a given size cup to measure out the proper volume of product. The product is metered from a hopper into the cup (the cup is filled to the top). Once the cup is filled, it indexes until it is discharged into the container. Different size cups can be outfitted to the machine to change the volume of product that is measured. As an example of what volumetric powder fillers are capable of, picture running a knife over the top of a measuring cup to ensure the proper volume is measured. The flexibility of volumetric filling systems allows them to be adapted to fill a wide variety of products ranging from thin alcohol to thick caulking compounds. Volumetric powder fillers can be used to fill rigid containers or light weight ones that may be distorted by the forces of vacuum or pressure used in some techniques. Solbern, Model PTF, stainless steel continuous motion inline tumble filler. Rated from 35 to 600 containers per minute – depending on materials, application and machine configuration. Container size: 2" to 7" diameter x 1" to 8" height. 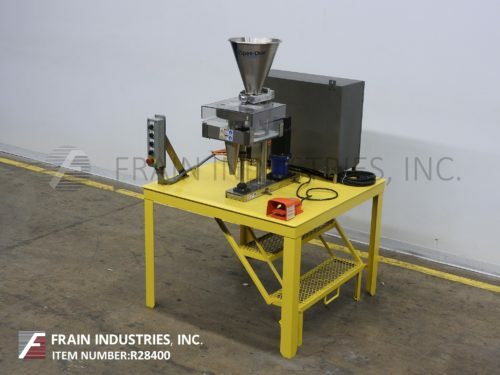 Equipped with a 120" long single chain conveyor with shaker though fill station, adjustable guide rails, 36" diameter x 30" long rotary drum powered by a ¼ hp drive with a variable speed gearbox, 9" x 9" product charge, product level sensors, 26" long x 1¾" wide x ¾" deep product buckets set on 9" centers, adjustable dimpled filling chutes, 4" diameter connection for dust collection and air blast container cleaning on discharge end. Control panel with push button start / stop controls and on / off switches for shaker, drum and conveyor. Mounted on a stainless steel frame. Spee Dee Model CBS Series lll, (4) pocket, stainless steel, servo driven, volumetric filler with number of containers per minute – depending on materials, application and machine configuration. Cup size range: 1.0" to 4.0" in Diameter; 0.62" to 12" in length. Fill range: 0.5 to 170 cubic inches. Change parts required to accommodate different size ranges. Equipped with 12" OD x 16" Deep, 1.5 cu ft stainless steel, conical product hopper, 12" OD plate has (4) 4" OD fill pockets with product leveling brush and dual clear plastic bolt down cover. 11" long product discharge chute with 1/2" OD product opening currently with 9" discharge height. Control panel has PLC controller with touch pad controls and digital readout also a hand held controller with on / off power and volume less / more switches, single index and e-stop push buttons. Mounted on stainless steel base platform. 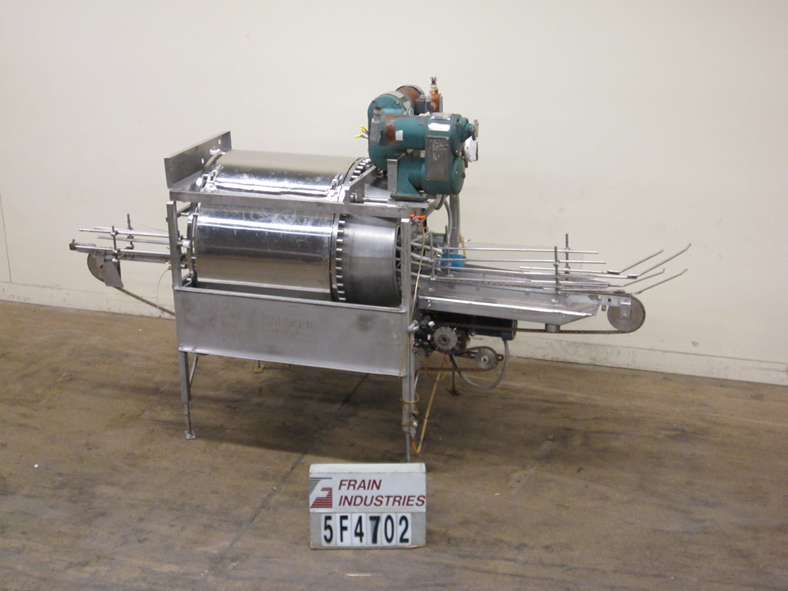 FEMC, Model 3800-000-003, (6) pocket angular dial servo volumetric filler. Rated from 10 to 160 indexes per minute with number of containers – depending on materials, application and machine configuration. Fill range: 5 in³ to 50 in³ (with proper change parts). Equipped with 32" diameter stainless steel angled product hopper with (12) telescoping fill pockets and 32" OD transfer plate with (6) pockets. Mounted on a stainless steel base with push button E-Stop. Spee Dee, Model CHS, (4) pocket stainless steel, servo driven, volumetric filler with number of containers – depending on materials, application and machine configuration. Cup size range: 1.0" to 6.0" in Diameter; 0.62 to 25" in Depth. Fill range: 0.5 to 700 cubic inches. Equipped with 20" OD x 26" Deep stainless steel product hopper, 16" OD plate has (4) fill pockets with product leveling brush, 16" long product discharge chute with 4½" OD product opening currently with 55" discharge height. Control panel has on / off power and volume less / more switches, single index and e-stop push buttons. Spee Dee Model CBE-4, four pocket volumetric filler rated from 6 to 48 indexes per minute with number of containers – depending on materials, application and machine configuration. Cup size range: 1" to 4" in Diameter; 0.62 to 12" in Depth. Fill range: 0.5 to 185 cubic inches. Equipped with 18" ID x 22" deep, stainless steel conical product hopper, 13" diameter plate, and 14" discharge chute with 63" ground clearance. Mounted on mild steal frame. Change parts required to accommodate size range. Continuous motion, straight line tumble filler capable of speeds to 500 cpm depending on size container and fill. Can handle containers from 1oz plastic to # 10 cans 6-1/2" Dia x 7" H. Filler uses container as measuring device, for precise filling. "Shake-While-Fill" orients product in container while fill angle determines volume, and no product waste. Comes with inline checkwiegher (to 10 LB) to auto reject & re-circulate out of range fills. Solbern Model PTFGP, continuous motion, straight line, tumble filler with number of containers per minute – depending on materials and application. Container size range: 1-1/2" to 6-1/2" in Diameter; 1-1/2" to 7" in Height. Equipped with 132" long container conveyor with adjustable height guide rails, 36" diameter by 48" long filling chamber, with vibration system, 36" long by 24" wide drip pan and stainless steel guarding. Mounted on a stainless steel frame with height adjustable legs. Filler uses container as measuring device for precise filling. "Shake-While-Fill" orients product in container while fill angle determines volume. Spee Dee, Model CJ6S416, (6) pocket servo driven volumetric filler. Rated from 10 to 140 indexes per minute with number of containers – depending on materials, application and machine configuration. Cup size range: 1" to 5½" in Diameter; 0.62" to 14" in Depth. Fill range: 0.5 in³ to 300 in³ (with proper change parts). Equipped with 6" diameter charge and 22" OD plate with (6) telescoping fill pockets. Mounted on a stainless steel base with push button single index. start / stop and volume more / less switch. Spee Dee, Model CBE284, (4) pocket volumetric filler rated from 6 to 48 indexes per minute with number of containers – depending on materials, application and machine configuration. Cup size range: 1" to 4½" in Diameter; 0.62" to 20" in Depth. Fill range: 2 to 1250 cubic inches. Equipped with 18" ID x 21" Deep stainless steel conical product hopper and 13" OD plate with (4) telescoping fill pockets. Control panel with push button start / stop and volume more / less switch. Change parts required to accommodate size range.